On a recent midday drive to a meeting downtown, I snapped the following picture of the Bank Tower (home of the .820 repeater) and the AT&T Tower (home of the .410 repeater) both in downtown Atlanta, Georgia. As many of you already now I love using and tracking repeaters. They are great places for idle QSOs while on long metro commutes which many of us endure. These two repeaters were, and in may ways still are the central hubs to much larger repeater systems, which have continued to dwindle due to the maturing of newer suburban repeaters and clubs. The Bank Tower looks and is a much larger building, after all Wikipedia ranks it as the 35th tallest building in the world and the tallest building in North America outside of Chicago and New York City, an impressive pedigree (it is about 1000ft tall). Meanwhile the AT&T tower is a not meager 677ft. (206-meter), 47-story skyscraper is almost as tall. On first blush it would seem the Bank of America Tower has a huge advantage as a repeater base, but one must take into account the that the antennas are not at the very top of the building, but closer to the 56th floor roof, the steel structure crowning the building adds height, but all of the antennas are not located at the very top of that structure. Here is an excerpt from their website to that point; "Our primary antenna for two meters is now located at the base of the "spire" near the building's peak. 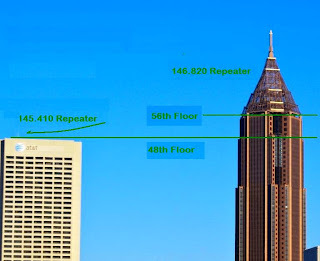 From this location our antenna has a virtually unrestricted line of sight to most of metro Atlanta." -- There use to be a better picture on the site but I could not find it, and the web statement is barely true. Both of these venerable Atlanta Metro Repeaters are well over 12 years old, and both are starting to show their ages in less than positive ways. Unlike the obvious possible pun from the opening line of a Tale of Two Cities, in the case of these machines I can not really say it "It was the best of times, it was the worst of times…". because in this case it closer to the later than the former. The w4PME 2m repeater is a Motorola 5000 (tube type transmitter) running about 60 watts output, but capable of over 320 watts continuous! -- recently this machine is suffering some sort of slow death by meltdown, although it still has an impressive coverage area it has frequent temperature lock outs in mid QSO, and this makes difficult to use. The theoretically equally potent w4DOC 2m repeater is a Vertex VXR-5000 repeater, controlled by a Link Communications RLC-3 controller hybrid with many receivers, a restricted-by-request transmit power of about 45 watts output (see ke4FOV's excellent presentation). -- Recently this machine has taken to not working very well, specially in wet weather. Its average effective range has shrunk to almost the size of the i-285 perimeter, on rainy days it's less. Both machines have remote listener repeaters located at Sweat Mountain. This accounts for the extended northern lobes in their coverage map. I wish to bring an awareness to these repeaters; which both seem to be running a fever, and are in need of dire medical attention. -- Please use them, and please contact the clubs that operate them. Upon contacting the clubs offer your support and your positive criticism of the recent decay of these once proud HAM pinnacles. Let them know we value and miss these repeaters. Great blog, JL. Definitely states a case for both repeaters, especially my beloved "8-2".